Newtown, PA, June 27, 2018) — CenTrak announced today the transfer of select assets of Awarepoint to its subsidiary Clinical Patents LLC (CPLLC). The transfer of assets will further expand CenTrak’s market-leading IoT Location and Sensing services with the addition of Bluetooth Low Energy (BLE) sensor technology. The transfer includes over twenty patents, many which are focused on mobile device locating and enhancing the accuracy and performance of traditional BLE systems. For existing Awarepoint customers, resources are in place to offer service and support. Awarepoint engineering and technical support personnel have been hired by CPLLC to ensure continuity of support. Awarepoint customers can speak with dedicated resources regarding conversion and upgrade options and report technical support issues. Please visit www.centrak.com/awarepoint or call 215-860-2928 x336 for details. 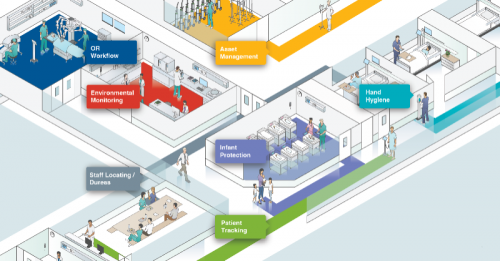 Awarepoint technology has been installed in hundreds of prominent hospitals and clinics throughout North America, leveraging hundreds of thousands of IoT sensors and tags. CenTrak now has access to key technology features, including mobile device locating to supplement CenTrak’s Connect™ platform, where it can be synthesized with the other technologies CenTrak already supports, including: Wi-Fi, Second Generation Infrared (Gen2IR™), UHF Active RFID, Low Frequency, Passive RFID, BLE and Advanced Ultrasound (IRUS™). The combination of these technologies will further expand the breadth of use cases which can be addressed using healthcare’s leading provider of Enterprise-class Location and Sensing Services.